It's a shame people seem to only think about cranberries around Thanksgiving. They have such a great flavor you can take advantage of all year long. 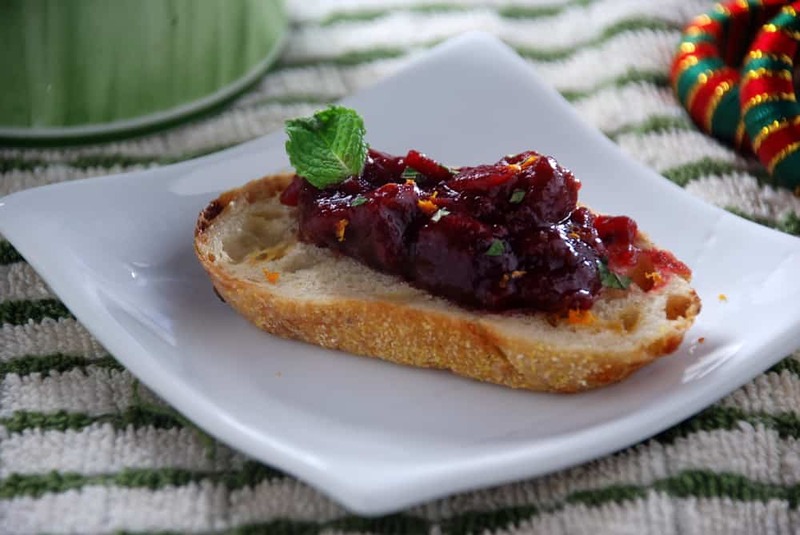 The tang from the cranberries goes great with many different ingredients, especially the spices and mint in this crostini. The crispy bread provides a crunch to the whole dish. The recipe is a typical cranberry sauce or chutney with some ancho pepper for smokiness and xanthan gum to hold it together. I've based the recipe off of a typically-sized bag of cranberries, but they vary in size and several grams in either direction won't change the base flavor much. While they can be eaten at any time of year, these are always awesome as a Thanksgiving appetizer! 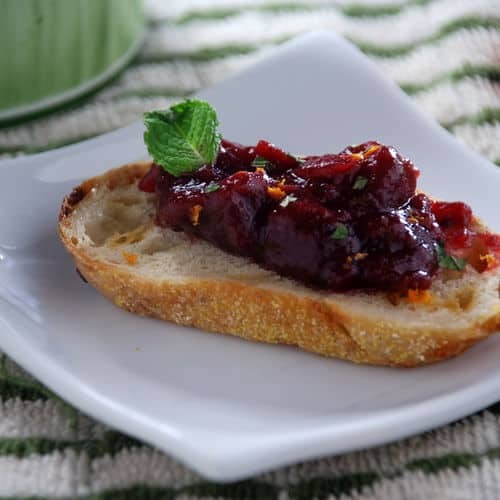 If you would like more information about the modernist techniques, ingredients, and equipment used in the cranberry chutney crostini recipe you can check out the following. Combine the cranberries, orange juice, water, brown sugar, white sugar, ancho pepper, and ginger in a pot. Bring to a simmer and let cook until the cranberries have released their juices, about 20 minutes. Remove the pot from the heat and discard the ancho pepper. Add the triple sec, cinnamon, cloves, and xanthan gum then blend well. You want the chutney to bind together but still have chunks of cranberry in it. The cranberry chutney will last for several days in the refrigerator and can be served cold or reheated. Place the crostini base on a serving plate, or individual plates. Add a spoonful of cranberry chutney then top with some orange zest, mint leaves, and almond slivers. This recipe combines the tang from cranberries with the smokiness from an ancho pepper. For a burst of flavor place on a crispy crostini and topped with with spices and mint. A great party treat!